After just an hour’s drive over the Bay Bridge and down Route 50, you find yourself in the unspoiled Eastern Shore of Maryland, filled with cornfields, breathtaking water views and towns without traffic lights or fast food chains, but plenty of mom and pop shops. It’s seems that the Eastern Shore has an even more cachet today then ever before. 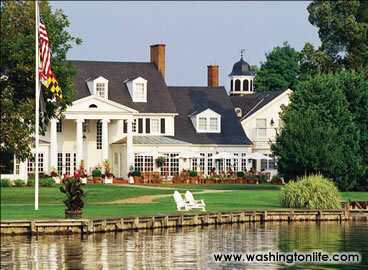 There are rumors that Lynne Cheney has been shopping at Pottery Barn to furnish their new Eastern Shore home. Over the summer, Sarah Jessica Parker was spotted in Easton filming her new movie, and Wedding Crashers starring Owen Wilson and Vince Vaughn was filmed at The Inn at Perry Cabin in St. Michael’s. Built in 1812, The Inn at Perry Cabin once served as a captain’s house for Purser Samuel Hambleton on the Cheasapeake Bay. It wasn’t until the 1980’s that it was transformed into a small luxury inn, eventually landing in the hands of Sir Bernard Ashley of the Laura Ashley Company. Under his ownership, it developed into a 41-room luxury hotel with five-star service. For years, however, guests frequently complained about the small, dark rooms, which many thought were overpriced. This is certainly not the case today. Seventeen million dollars later and with The Orient Express Group as the new owners, The Inn at Perry Cabin is a much-changed property, and transformed into a true relaxation oasis away from the city. Half of the rooms are located in a newly expanded wing with the look of a contemporary Maryland seaside inn. At first glance it appears simplistic, clean lines with solid colored furniture. Then you discover the carefully chosen antique drawings depicting the anatomy of shells. After pressing a button to cause the television to rise from a small box at the end of the bed, you realize that every detail in the room is carefully planned. Rooms boast elegant working fireplaces and overstuffed couches ideal for curling up to read. Each bathroom is spacious with oversized bathtubs and marble showers. The other accommodations are located in the historic wing where Lord Ashley’s English Country influences are still seen in the floral fabrics and pastel colors. These rooms are smaller but still offer many of the same luxuries: large beds, sitting areas and impressive views of the Chesapeake Bay. They feature many of the original Early American antiques that past owners collected throughout the years. The award-winning Sherwood’s Landing restaurant offers the best of Eastern Shore fare, including blue crab, mussels and oysters. On select days, chef Michael Salter walks down to the farmer’s market for local, organically grown produce to create a “market menu,” ranging from fresh ahi-tuna with corn, zucchini and squash to free-range chicken and new potatoes. Salter’s approach is modern classical, with a light emphasis on quantity, so that you can enjoy three courses without guilt. The minimalist décor directs your attention to the harbor where large sailboats glide by the large yachts moored at the pier. The restaurant has earned many accolades from Wine Spectator and four diamonds from the Mobil Travel Guide. They are well deserved. For those seeking more casual fare, the Purser’s Pub serves burgers, fish and chips and afternoon snacks. The rich hardwood floors and openhearth fireplace make it a perfect spot for a card game or a round of backgammon or chess. The chef makes sure to welcome each guest, including their furry-legged friends, with welcome pet packs stuffed with gourmet dog biscuits. In 2006, the hotel will open a state-of-the-art full service spa featuring facials, massages and customized treatments. This will complement the Inn’s Nautilus exercise facility and outdoor infinity edge pool. Every sport you can possibly play in animal embroidered pants is also available: bocce ball, croquet and badminton, in addition to nearby facilities for golf and sailing. In winter, the inn offers local hunting and jazz weekends. The town of St. Michaels and Easton are also ideal for antiquing. The Inn at Perry Cabin, 308 Watkins Lane, St. Michaels, Md., (410) 745-2200, www.perrycabin.com. Rooms range from $295 to $745.